Pain and laughter often go together. Almost simultaneously after a terrible argument, people laugh. If they don’t, they either continue with more pain or separate from each other, sometimes for good. I had a friend who, when confronted with difficult situations, laughed hysterically. I always hated it because she did it too much. She never wanted to face the problems that we all must confront. Her laughter actually divided us. But, that’s not the laughter I’m talking about. I’m talking about the laughter that brings people together despite their differences. Laughter means walking in someone else’s shoes for a day, a week, a month, a year, a lifetime. 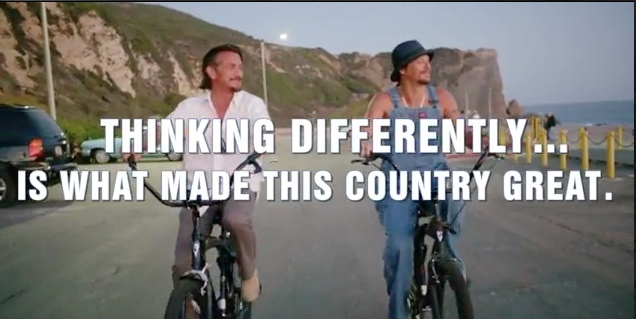 “Americans,” a short, public service film starring Sean Penn and Kid Rock, directed by Jameson Stafford. We are all heroes in our own right. But, we face enormous obstacles when communicating our ideals to people who don’t agree with us. We fall, hard, and need a helping hand. More often than not, that helping hand will come from the person who doesn’t believe what you believe. All you have to do is remember an argument you had with your parents or siblings, any family members. That person might be angry with you at that moment but would take a bullet for you the next. Recently, my husband shared a video with me when I was telling him about some of my students arguing with each other over being Democrat or Republican. I’m sharing this video with you because I couldn’t stop laughing, because I love Sean Penn and now I kinda like Kid Rock too. After a few weeks of overcoming some major disappointments, I’m adding a new tab to BraveSmartBold called Laughter. It’s just necessary. Many of you may have already watched “Americans,” a short, public service film starring Sean Penn and Kid Rock, directed by Jameson Stafford. If you haven’t, then you must. You will laugh and through that laughter realize how important it is to keep talking to each other, to keep teaching each other. Mostly, I hope you remember how important it is to listen, face your fears, and look your enemy in the eyes. Then, remember, that person could be the one who takes the bullet for you. I saw this earlier today and loved it.. So many lines in the sand in our world and in reality, they are unnecessary and hilarious. Thanks for sharing this, hope many people watch it.. it’s great!! Me too. Little reminders keep us grounded instead of so caught up in our ideals. Couple days ago my cousin came over and throughout the whole night we talked about SO many things -about life in different cities, memories from his and my mums home country- or just laughing at the dating show that has some really wierd people in it. Talking about deep issues about our world our family or sharing laughs really UNITED us even though there were so many different things about us all. Different age groups, different cities, etc. It’s the best moments of our lives and we often forget how valuable they are. Thanks for sharing. NOTE: It’s the truest of human emotions and no doubt create the strongest bonds between us!